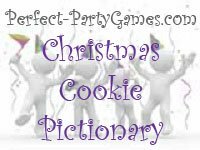 Summary: Christmas Cookie Pictionary is played with sugar cookies and frosting rather than pen and pencil. Have the cookies, frosting and word strips available on a table. The first team begins by choosing a player to be the one to draw the word on the cookie using only the frosting. This player will choose a slip of paper containing the first word and has 5 seconds to look at the word and come up with a strategy. The player can not use letters, only pictures to get their team to guess the word from the slip of paper within one minute. If the team guesses corectly, they get a point. It is then the next teams turn to choose a slip of paper and draw a different word on their cookie. Everyone should get a chance to draw on a cookie. The team with the most points at the end of the game, wins.